How Do You Win a Child Custody Case in California? 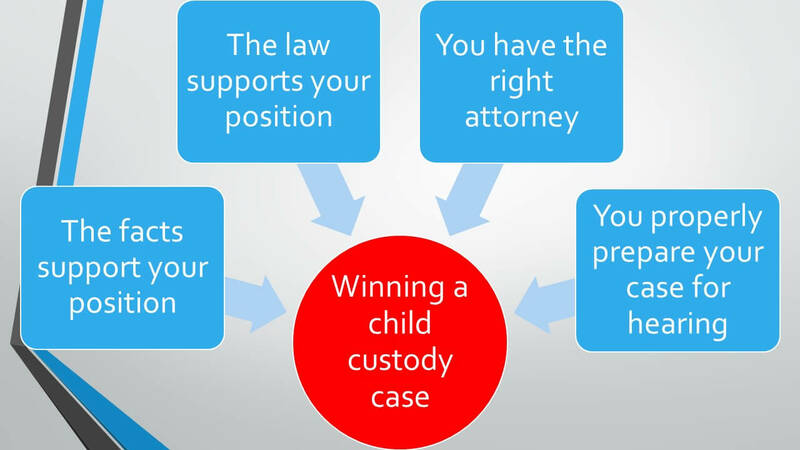 How do you win a child custody case in California family court? You know what this article is about; winning a custody case. Let us first tell you what it is not about. It is not about how to make false allegations, alienate a child or engage in other misconduct to win. That is because we wrote this for good parents, those who want to win their custody case in a California family court. A good parent is one with integrity. He or she focuses on the child's best interest. There must be a child-focused reason the other parent should not share equal or close to equal parenting time with the child or children. Here are a list of topics we cover. You can click on any of the following to skip ahead. What are the keys to winning any child custody case in California? Is that all of them? No, it is not. The above are the most common. Have the courage to take the custody case to court, if it becomes necessary. Wanting to protect the children from an abusive, neglectful or unfit parent is not enough. You have to follow through. If the other parent disagrees with your position and there is no settlement, your case will proceed to court. Court means the judge makes the decision. Courage is not the lack of fear. Court can be scary. A skilled child custody lawyer will prepare you. Here are the roles the attorneys play in child custody litigation. If your position has merit, advocate your position in court. If your position does not have merit, your attorney should candidly share that fact with you. The other parent’s attorney is not your advocate. He or she is not your friend. He or she is the other parent’s advocate. Since many lawyers are unfortunately puppets or mouthpieces, do not expect him or her to evaluate the case objectively. The child’s attorney is an attorney appointed for the child to express the child’s wishes or investigate the issues. Other experts on select issues like an addiction expert to evaluate a parent’s substance abuse issue. Frustration of parenting time is an important factor. However, frustration of parenting time should be serious if it causes a child custody case to land in court. There is more to Family Code 3044 than what we wrote, above. The part in bold is the part we wanted to emphasize. Document the other parent’s misconduct. Use text messages or emails to confirm what the parent has done and is doing. Write everything politely and with the knowledge the judge may read it one day. Do not make offensive comments or personal attacks. Focus on the child or children. Attempt to co-parent but also emphasize the other parent’s misconduct. Give the other parent a short window of time to do the right thing. Do not allow a status quo that limits your parenting time to continue. Hire a family law attorney early in the process. File the child custody papers early. You need court orders, not false promises or hope that things will somehow work. Has never seen the damage alienation causes to a child’s mental state. Document the other parent’s misconduct and be clear with the other parent he or she needs to stop. Have no patience for ongoing misconduct. If it does not immediately stop, hire an attorney and seek court intervention. Step into the court process with the expectation the issues will proceed to a court hearing. Negotiating with a parent who is committed to destroying your relationship with your children is like negotiating with a terrorist. Expect you will need to seek sole physical custody of the children. If the parental alienation has already taken hold, get into counseling with your affected children. You can obtain court orders for that. What is Parental Alienation and What Can You Do About it? There is more to this code section than what we wrote, above. Written admissions by the abusing parent. This may be text messages, emails, etc. Any other person the other parent has abused. “(a) No parent shall be placed on supervised visitation, or be denied custody of or visitation with his or her child, and no custody or visitation rights shall be limited, solely because the parent (1) lawfully reported suspected sexual abuse of the child, (2) otherwise acted lawfully, based on a reasonable belief, to determine if his or her child was the victim of sexual abuse, or (3) sought treatment for the child from a licensed mental health professional for suspected sexual abuse. Hire a family law attorney immediately. The moment you face false allegations, this is your most important step. Document the false allegations. Your family law attorney can communicate with the other parent or his or her attorney. Hire a private investigator to start interviewing witnesses. If the other parent has reported the allegations to the police or social services, get a criminal law attorney involved immediately. He or she will work with your family law attorney. If you have current court orders the other parent is violating, consider whether you should file an immediate contempt action against the other parent. If you do not have court orders, commence a family law action. If you and the other parent are married, most people start with a divorce petition. If you and the other parent are not married, commence a parentage petition. After filing, proceed with filing and serving a request for order. Seek sole legal and sole physical custody. Seek professionally supervised visitation against the parent if he or she makes false allegations of child abuse. Take the other parent’s deposition. You want to flesh out the falsity of the allegations. A skilled child custody attorney will show through a deposition the false nature of the allegations. Set up the case for attorney’s fees against the other parent if he or she makes false allegations of abuse. Family Code 3027.1 provides for fees and costs against the other parent and others. Gather corroborating evidence of the substance abuse. This includes anything that shows the abuse. Arrests, criminal convictions, terminations from employment or discipline at employment due to substance abuse, medical or hospital records, etc. are all relevant. Interview witnesses and consider taking their deposition. Those who have personal knowledge of the substance abuse are helpful when a person denies the substance abuse. Take the substance abuser’s deposition once you have completed items 1 and 2. A comprehensive assessment by an addiction expert. If the abuse is that of prescription drugs, request the other parent’s CURES report. Do not accept anything less than alcohol or drug testing. Promises without a court order mean nothing. The alcohol or drug test order should confirm a failure to take the test or a “diluted” test is the same thing as a positive test. The alcohol or drug test order should also include specific consequences of a positive test. Sometimes, it is appropriate to include an automatic suspension of parenting time. “(a) If a child is of sufficient age and capacity to reason so as to form an intelligent preference as to custody or visitation, the court shall consider, and give due weight to, the wishes of the child in making an order granting or modifying custody or visitation. (d) Nothing in this section shall be interpreted to prevent a child who is less than 14 years of age from addressing the court regarding custody or visitation, if the court determines that is appropriate pursuant to the child’s best interests. (e) If the court precludes the calling of any child as a witness, the court shall provide alternative means of obtaining input from the child and other information regarding the child’s preferences. (f) To assist the court in determining whether the child wishes to express his or her preference or to provide other input regarding custody or visitation to the court, a minor’s counsel, an evaluator, an investigator, or a mediator who provides recommendations to the judge pursuant to Section 3183 shall indicate to the judge that the child wishes to address the court, or the judge may make that inquiry in the absence of that request. A party or a party’s attorney may also indicate to the judge that the child wishes to address the court or judge. (g) Nothing in this section shall be construed to require the child to express to the court his or her preference or to provide other input regarding custody or visitation. (h) The Judicial Council shall, no later than January 1, 2012, promulgate a rule of court establishing procedures for the examination of a child witness, and include guidelines on methods other than direct testimony for obtaining information or other input from the child regarding custody or visitation. Do not pressure the child. If the evidence later shows the child expressed a preference because of the pressure you placed on him or her, you may lose parenting time. If the reasons are due to physical abuse, serious neglect, or substance abuse, file the request for order quickly. Consider whether an emergency application is appropriate. If the reason is unrelated to the above and the child is not in danger, play devil’s advocate. Ensure the reasons are sincere. You do not want to spend thousands of dollars only to find out you were wrong about the preference. Learn whether the judge assigned to your case prefers to speak with the child directly or whether he or she will appoint another person to speak with the child. The other person may be a lawyer for the child (called “minor’s counsel) or an internal court investigator. Confer with the other parent about the child’s choice. This will help you better understand what the other parent’s position is before you file the request for order. If the parent does not provide good reasons to oppose your request, your attorney can correspond with him or her. The correspondence can put the other parent on notice of your intent to seek attorney’s fees if the other parent unreasonably opposes the request. With older teenagers (15-17), build reasonable flexibility into the requested order. If the other parent falsely claims you are alienating the child, pressuring the child, etc., flesh out those false allegations by taking the other parent’s deposition. It is one thing to claim it. It is quite another to prove it. How is a Child’s Preference and Choice in Custody Determined? Ready to discuss and win your child custody case? Our family law firm represents clients in each of the seven Southern California counties. We are experienced child custody attorneys. We know what it takes to prepare a case for victory. We know how to win inside of a courtroom. If you want an objective evaluation of your situation to determine if your position has merit, contact us for an affordable strategy session. We have offices in Orange County and Los Angeles. How Can a Mother Lose Custody of Her Child?